Everyone knows the stats by now. Ronald's AAA numbers at age 19 were better than Mike Trout's AA numbers at the same age. Then Ronald went on to win the AFL MVP after hitting .325 with 7 HR. The youngest winner ever. He's going to win ROY and MVP this year. Lol no. I have a lot on my plate IRL and forgot about it. What was it? I will bet you that he has a 30/30 year, though. Trout did it as a rookie. Is that something in which you'd be interested? If he doesn't post 30+ HRs and 30+ SBs at the MLB level next year, you're gone. If he equals or beats both those marks, I'm gone. If I win, I don't want you gone, though. You crack me up and provide good insight. I'm in college and just generally take some time off following baseball in the winter, anyway. Then let's change the stakes to donating to a charity of the winner's choice. You can pick the amount. These bets with other people have already provided a nice boost to my old high school's athletic department budget, so I'd like to keep it going. As a bonus, I personally match any donations made. 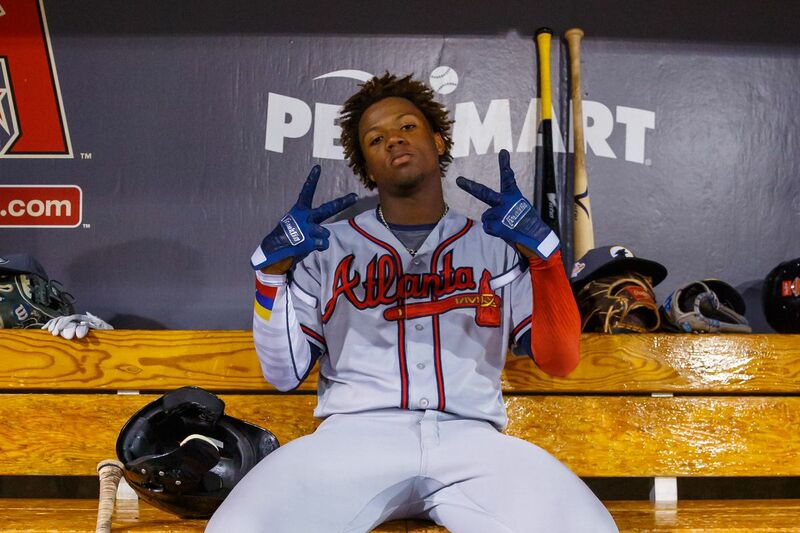 When a reporter mentioned that Moylan's 17-year-old daughter is just three years younger than Braves top prospect Ronald Acuna, the reliever smiled and said, "Yeah, they'll probably never meet." if he's only trout i'll be disappointed. 30/30 is a high bar, but I like your moxie. Somebody, some day will make a splash as a rookie like Trout did. Actually predicting such from a specific player, no matter how good, is statistically not wise, but it'd sure be nice. 30/30 as a rookie (with at least two weeks in the minors, assuming AA is as smart as we think) is really far out there. I can't say I actually expect it, but I will admit to being a little disappointed if he isn't better than a two WAR player this year. 8-19. .421 average. .476 OBP. 1.055 OPS. 1 HR. 4 RBI. 2 SB. LET RONALD WEAR HIS HAT SIDEWAYS. How much money for charity is our bet? After the game today you should be feeling pretty confident. Let's make it $100? I do not have enough money to make any financial bets. I am a college student scraping by. I was fine making the initial ban bet- if he doesn't have a 30/30 year, I'm gone. I just don't want you banned when Ronald does the unthinkable. The unimaginable. You are too valuable to the board and your skepticism is warranted. I do not have enough money to make any financial bets.. I am a college student scraping by. I was fine making the initial ban bet- if he doesn't have a 30/30 year, I'm gone. Maybe @thethe will stake you. Stakes must be equal. Guess we switch to a sig bet. Just do a sig or avi bet, neither of yall should leave. I love Acuna's potential, but man, just like I said a .300 BA this season when he comes is overboard, 30/30 is also overboard. It's not that he can't possibly do both in the future, but as a 20 year old rookie, yeah I'll be having crow if we see that happen. 20/20 is more realistic.